Some garage conversions may require planning permission and we shall check this prior to commencing your new conversion and all conversions require building regulations to enable them to achieve the adequate heat values and health and safety requirements now that they shall be habitable room or rooms. We shall take care of all the plans and deal with all the building control and local council. 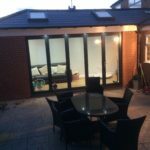 We offer many different garage conversion combinations from straightforward single conversions to double garage conversion; both one and two stories extensions. Double garage conversions can be transformed into one large space, probably the largest space in your house, or sub-divided to suit differing requirements. Our conversions are created to be bespoke and to suit your own individual specifications.